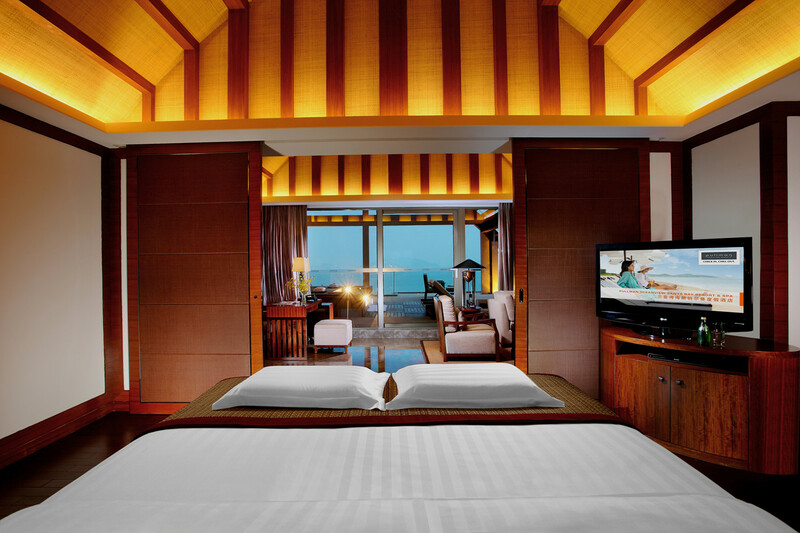 All the offers include buffet breakfast, local tax & service charge for max.2 adults/room/night. 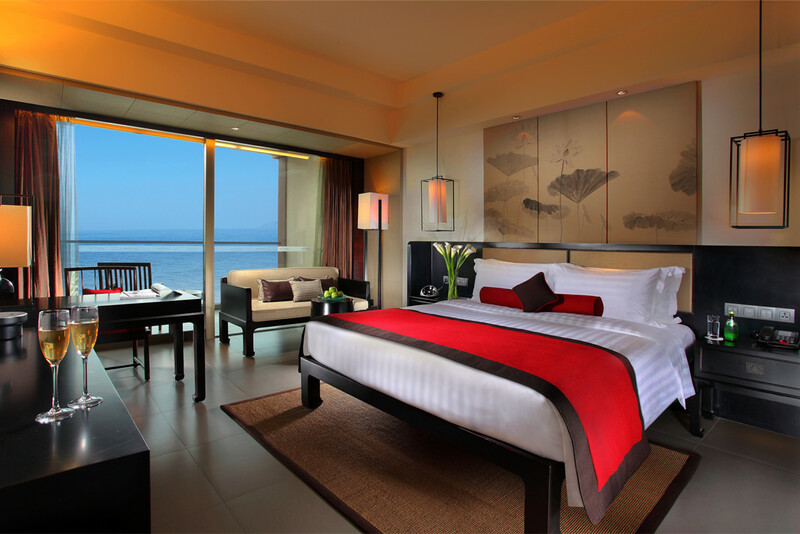 Extra bed: CNY418/night with 1 person's buffet breakfast, local tax and service charge. 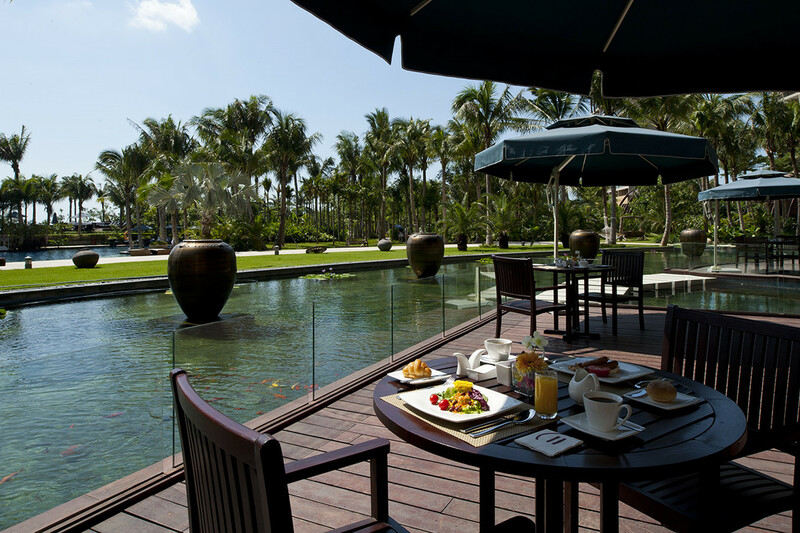 Extra breakfast: CNY168/person/day (from 12 years old). 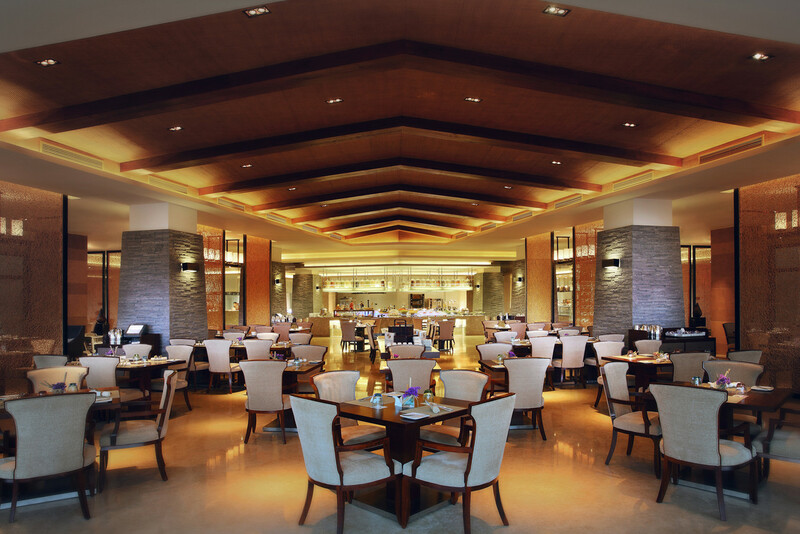 Child under 12 years old stays with parents can get free breakfast (only 1 child). 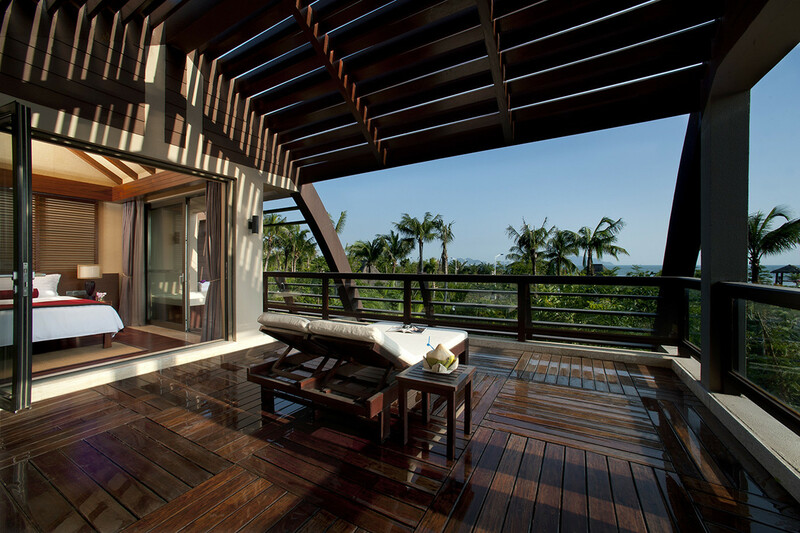 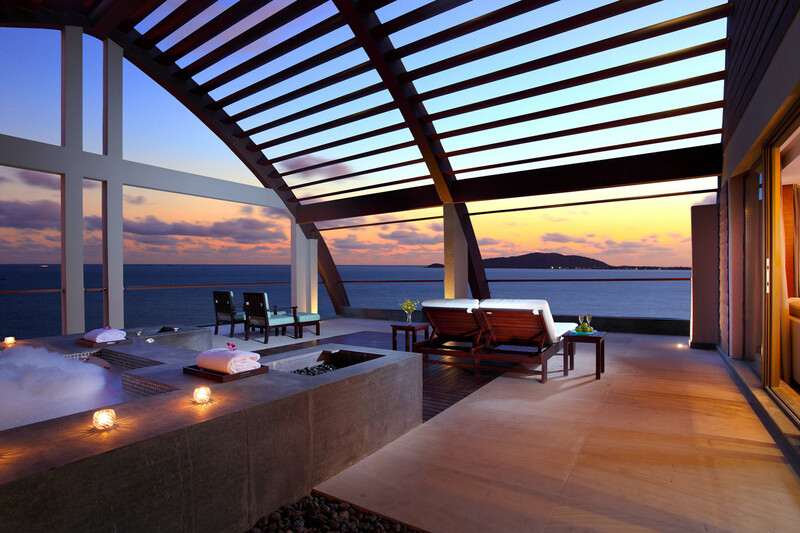 Pullman Oceanview Sanya Bay Resort & Spa,Super New international Resort on Sanya Bay with great pools, private beach services, and Great Ocean View Suite. 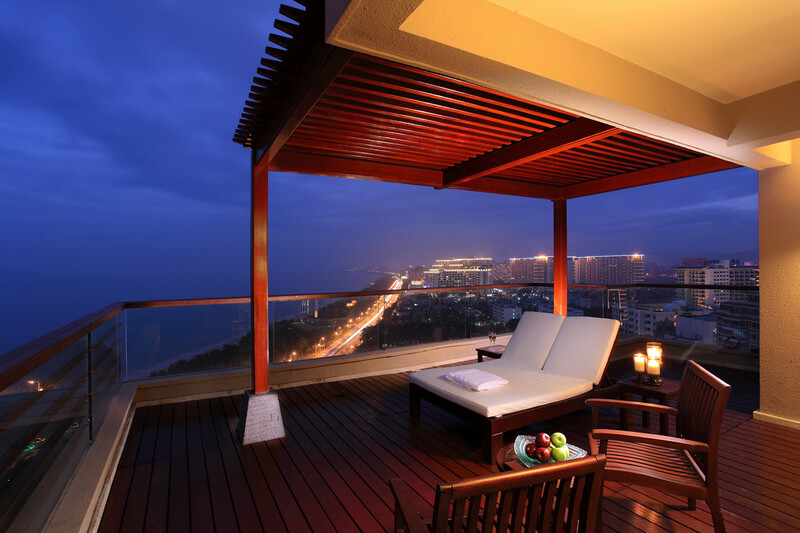 Right on Sanya Bay Beach, only 8 kilometers from Sanya City Center, 6 kilometers from Sanya Phoenix Airport, only 10 kilometers from End of the Earth, 40 kilometers from Nanshan Buddhism Cultural Tourist Zone. 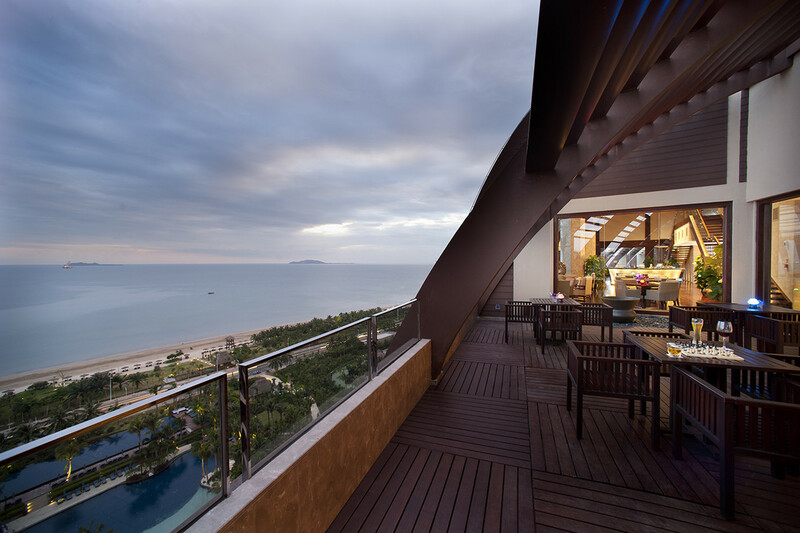 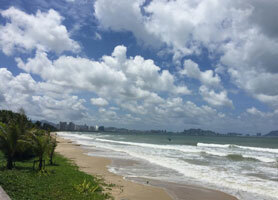 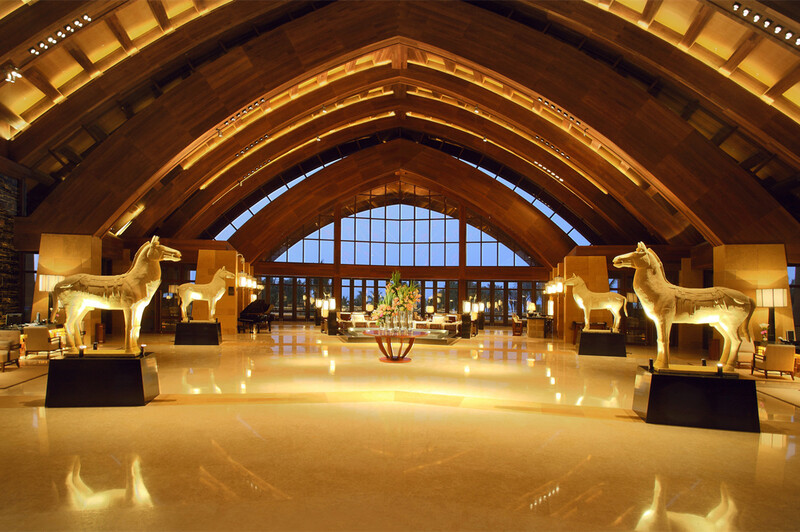 Our recent visit to Pullman Oceanview Sanya Bay Resort & Spa on Sanya Bay was on July.25th. 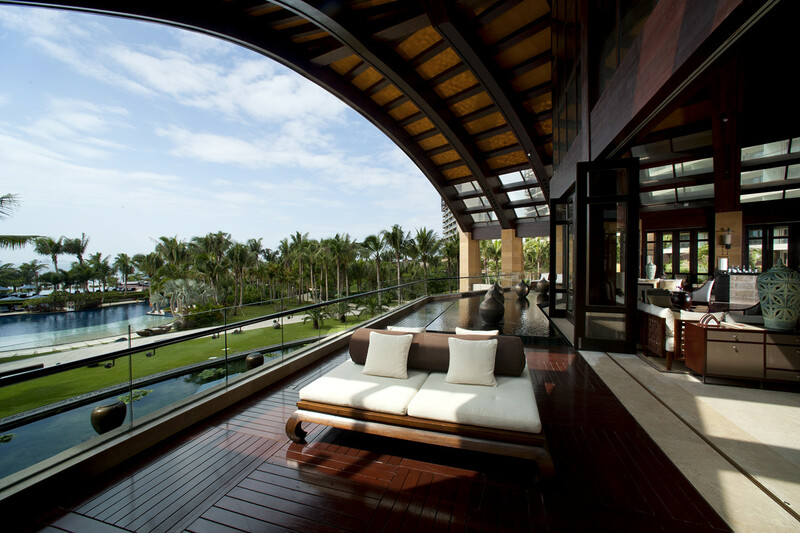 Pullman Ocean View Sanya Bay Resort & Spa is so far the only international brand on Sanya Bay for a unique holiday experience, including private beach, tropical garden & a range of outdoor pools, less than 10 minutes driving to Sanya Airport. 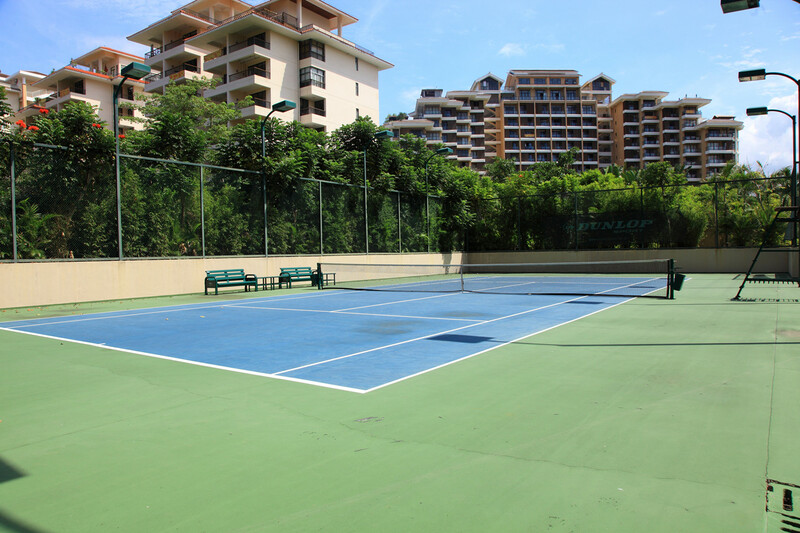 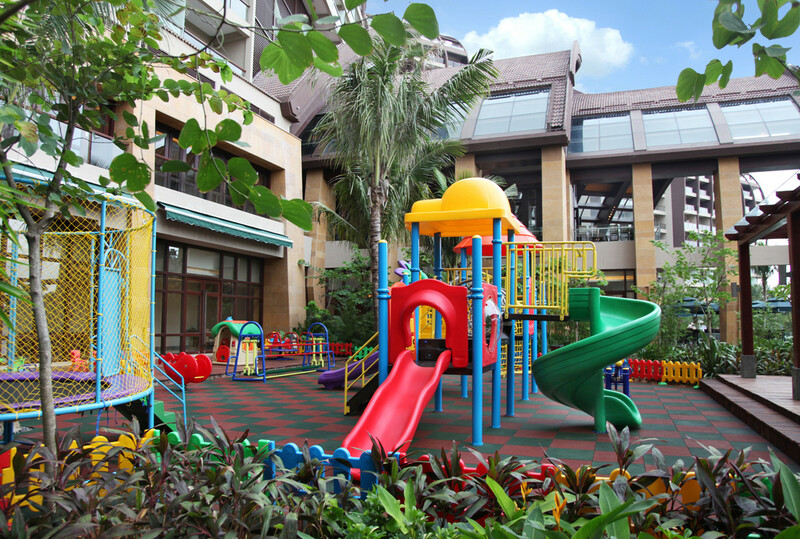 There are great facilities for kids too including outdoor & indoor kids club. 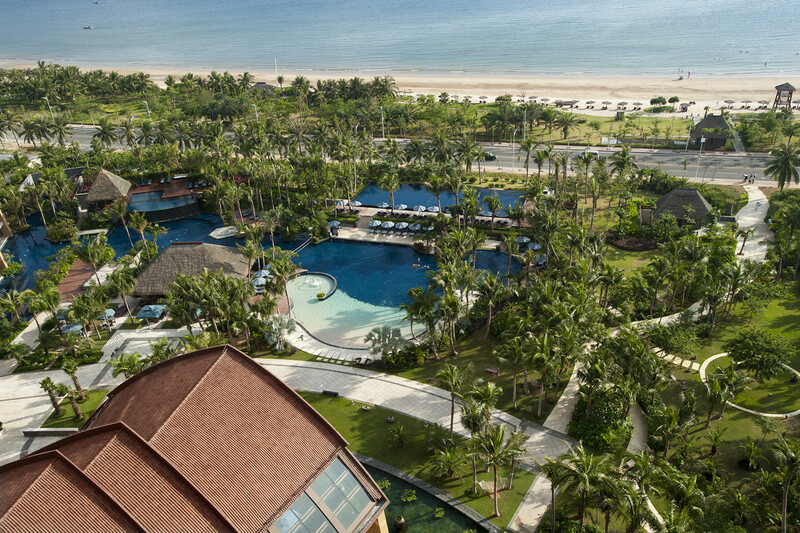 There is a road between Pullman Resort & Sanya Bay, so Pullman Resort Sanya Bay built an underground path which makes your way to Sanya Bay beach very safe. 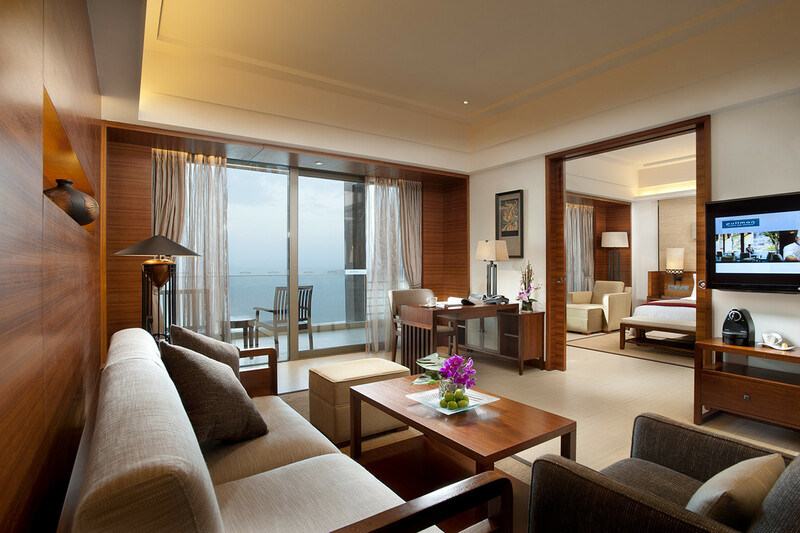 Except for normal hotels, there are serviced apartment with 2-4 bedrooms which makes Pullman Sanya Bay Resort the best choice for a high-quality family stay on Sanya Bay. 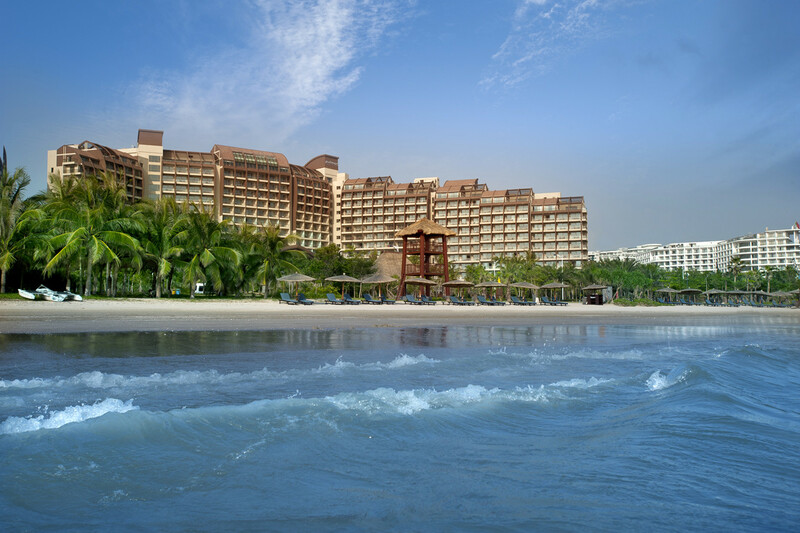 In winter time (Dec. till Feb.), Sanya Bay is warmer than Yalong Bay, less windy, so Pullman Oceanview Sanya Bay Resort & Spa is a perfect choice for family stay during Christmas & New Year in Sanya. 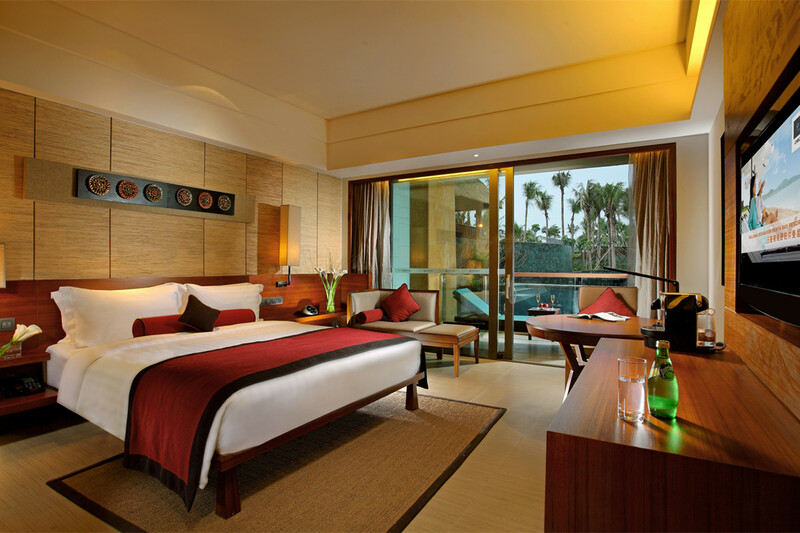 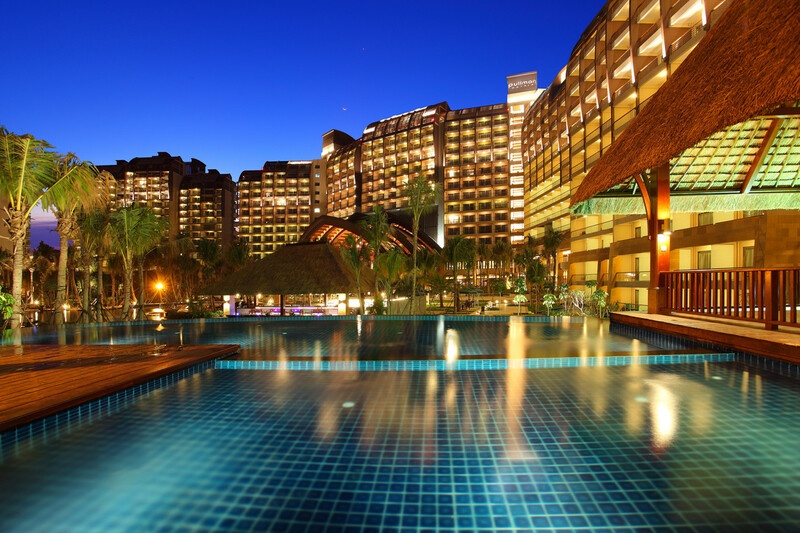 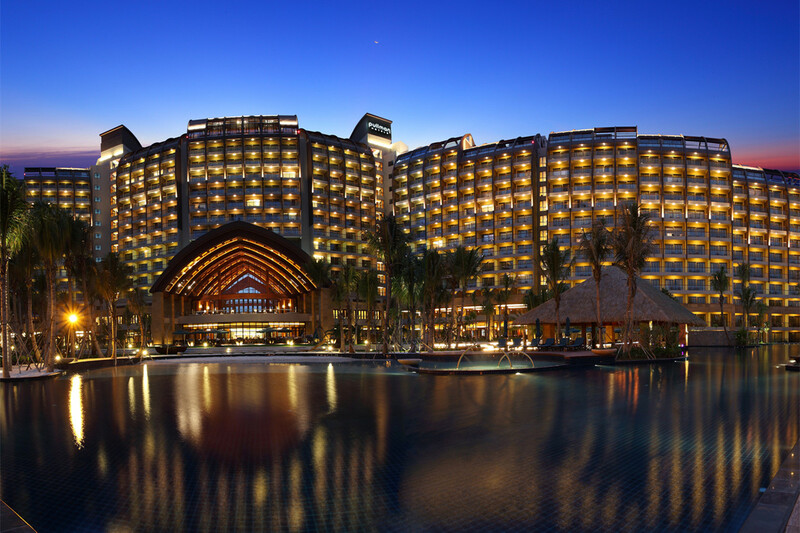 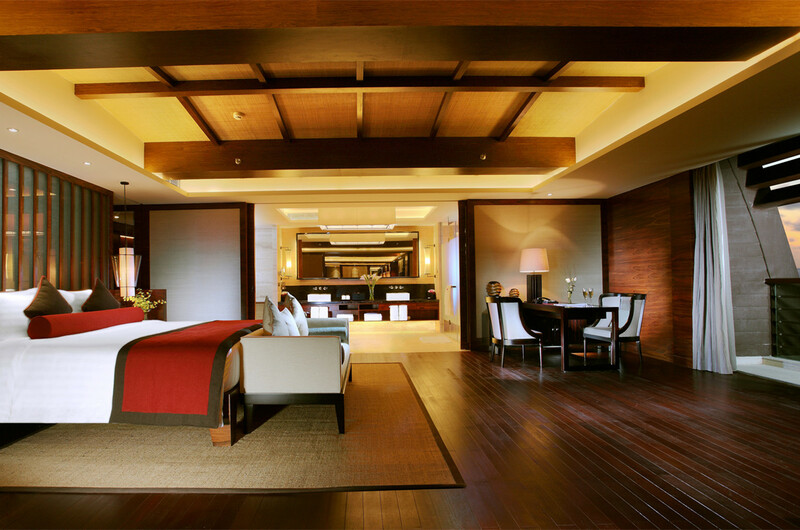 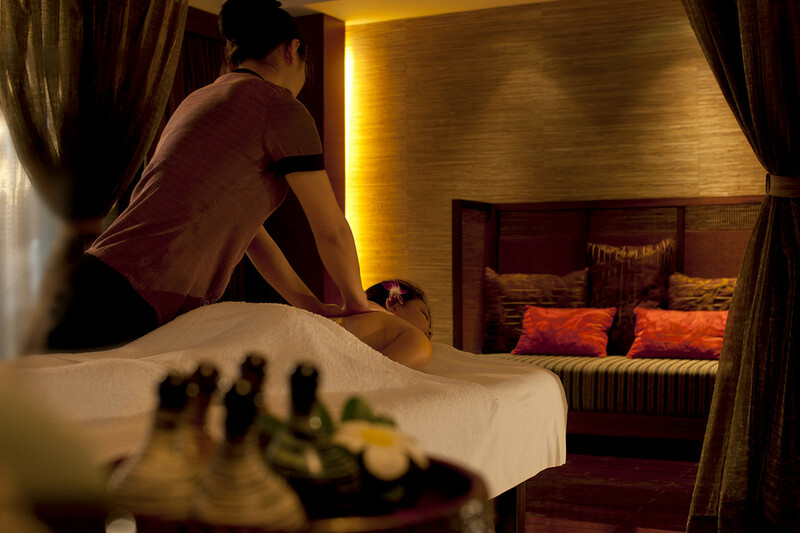 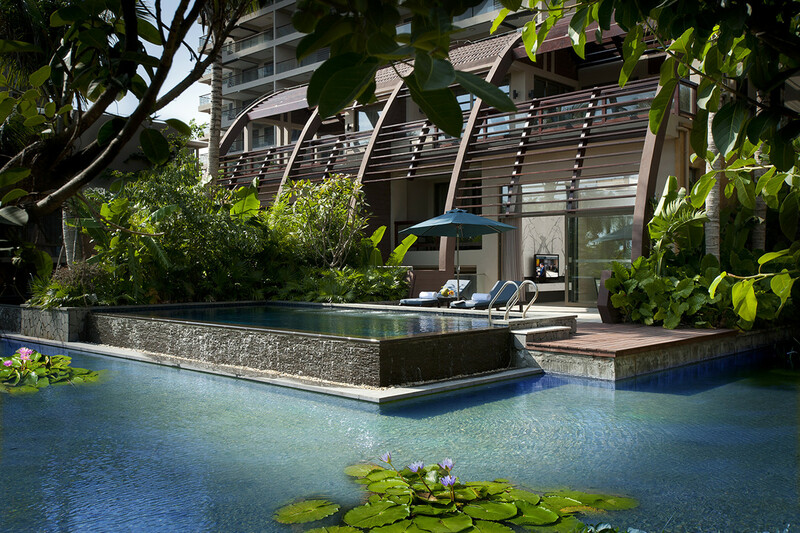 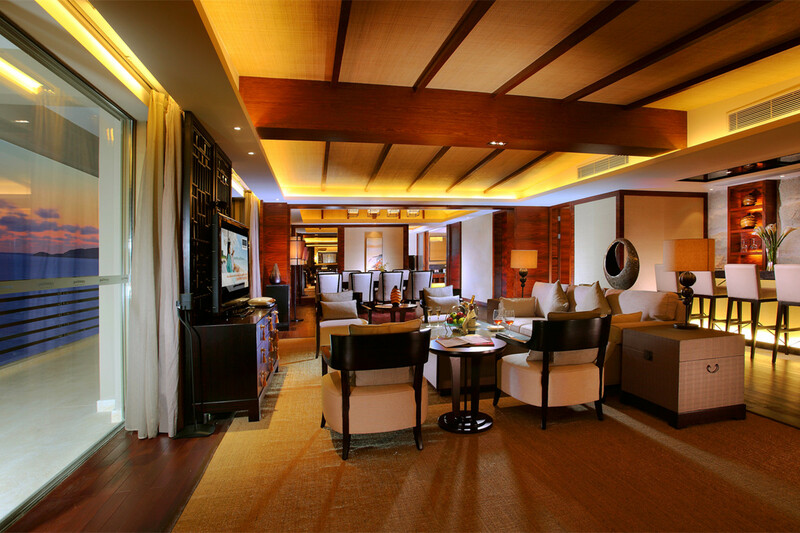 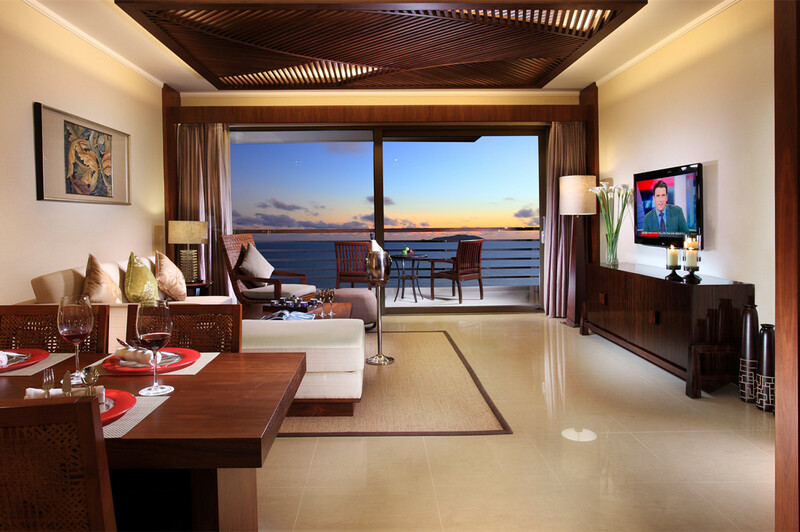 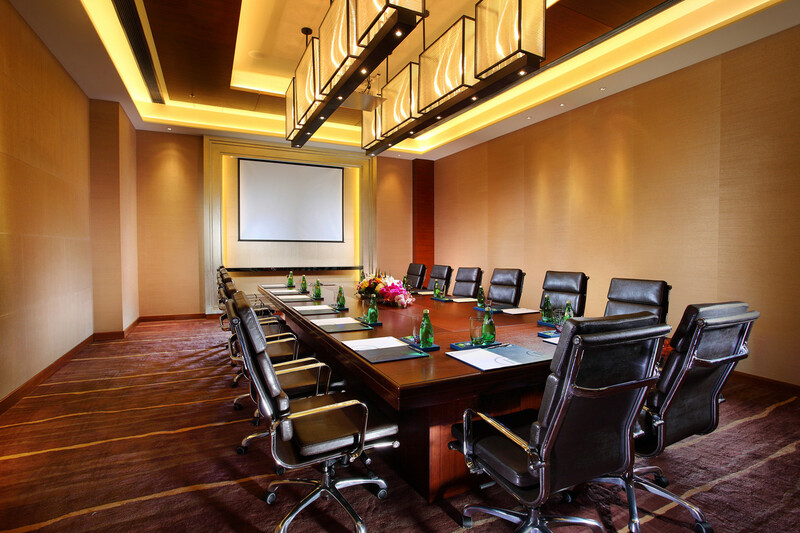 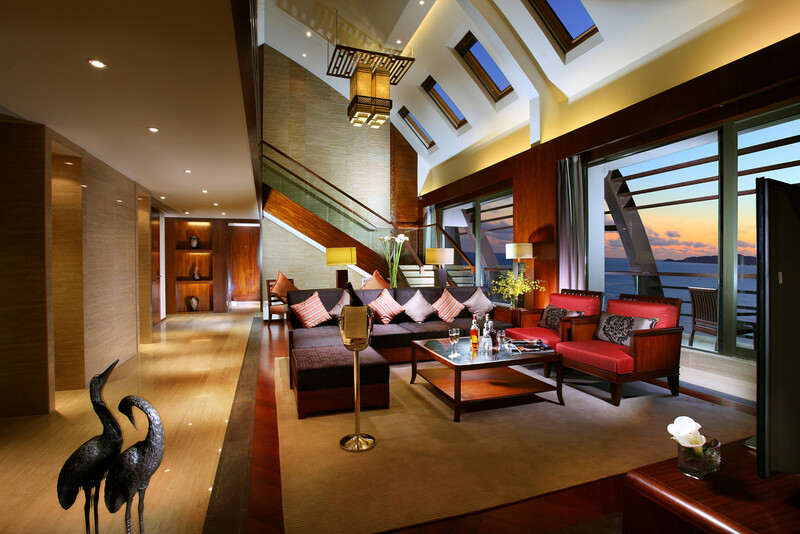 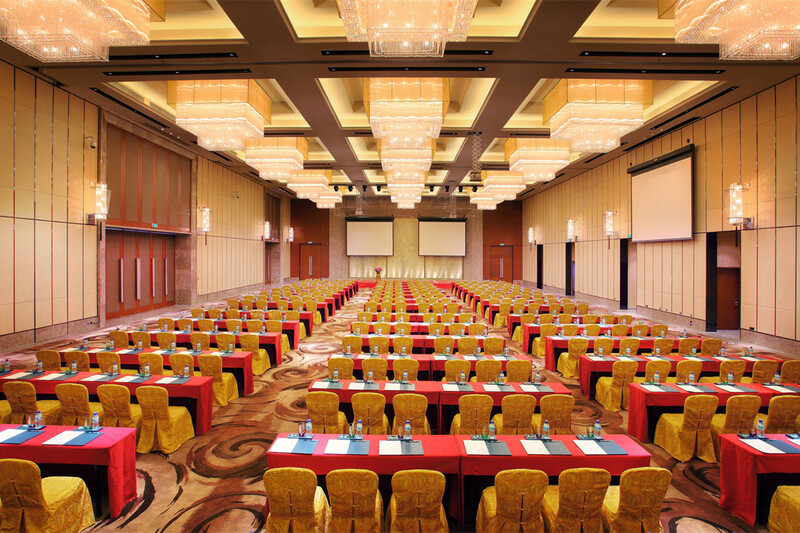 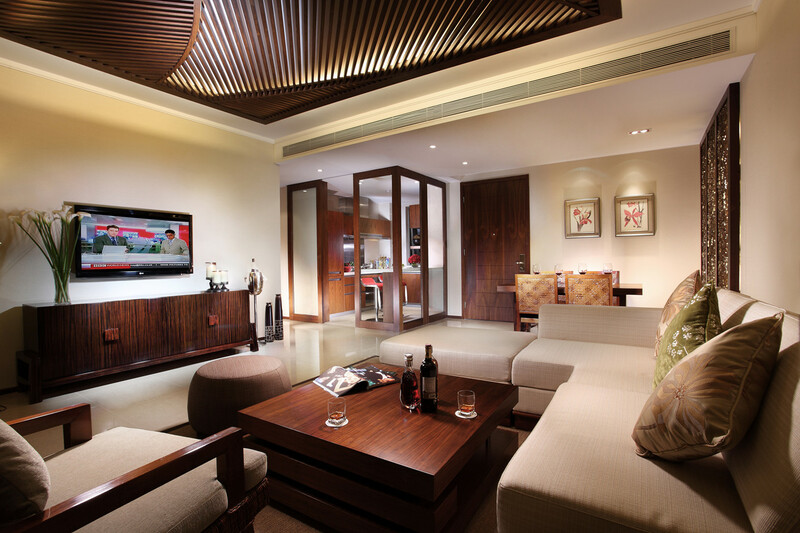 There are total 413 rooms including 137 non-smoking Rooms, 21 suites, and 8 villas. 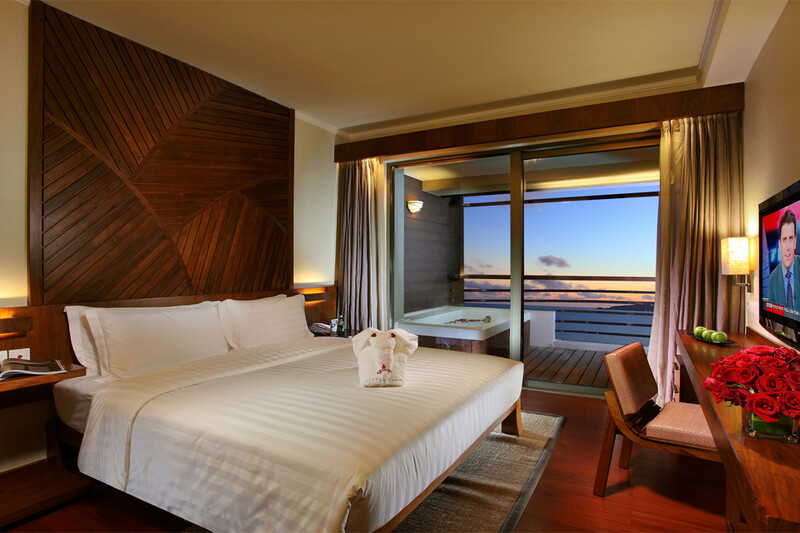 Rooms are really spacious with modern facilities and services, private balcony, big bathrooms, separate showers, bathtub, and free internet access. 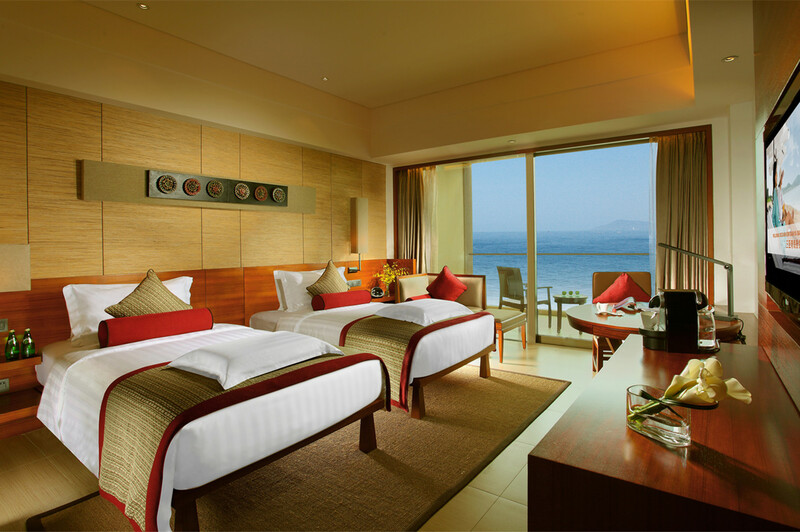 Deluxe Ocean View Room with Balcony: great ocean, garden & pool view on a higher floor with breakfasts for 2 adults + 1 child less than 12 years old. 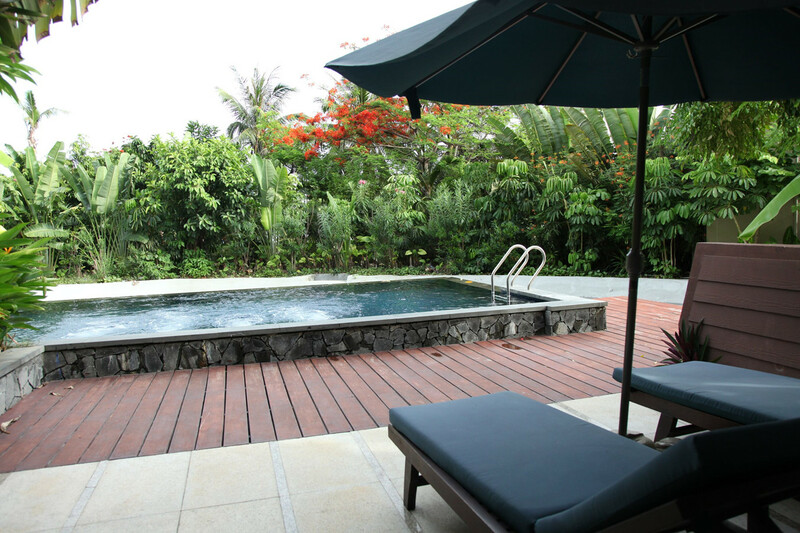 Deluxe Pool Access Room: on the first floor, with wonderful garden view, direct pool access with breakfasts for 2 adults + 1 child less than 12 years old. 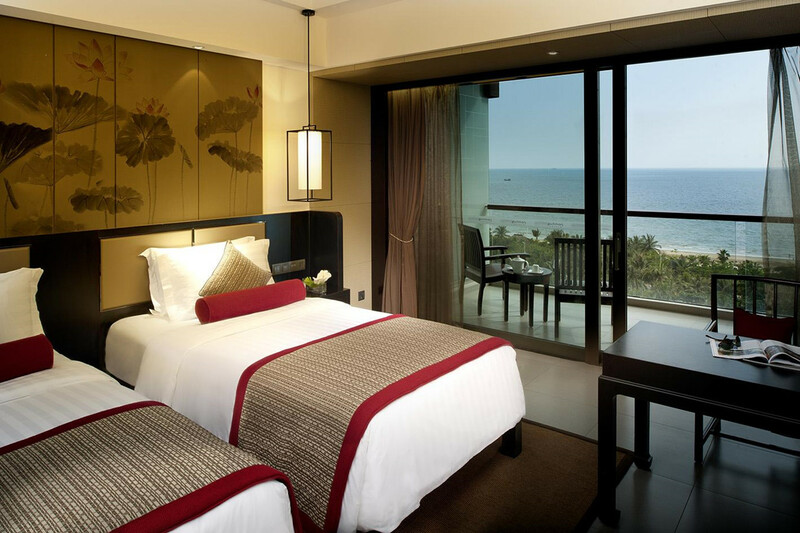 2 Bed Room Suite Ocean View: with 1 master bedroom with one king size bed (1.8*2.0 meters) and the other bedroom with one single bed (1.2*2 meters), 2 bathrooms, 1 living room, 120sq. 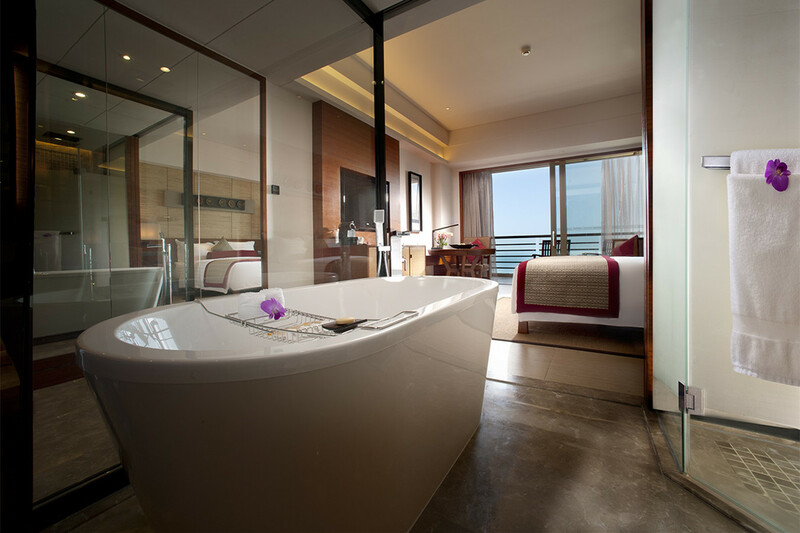 meters, great ocean view balcony with bathtub, washing machine, full kitchen with refrigerator, Breakfasts for 2 adults + 2 kids or 3 adults. 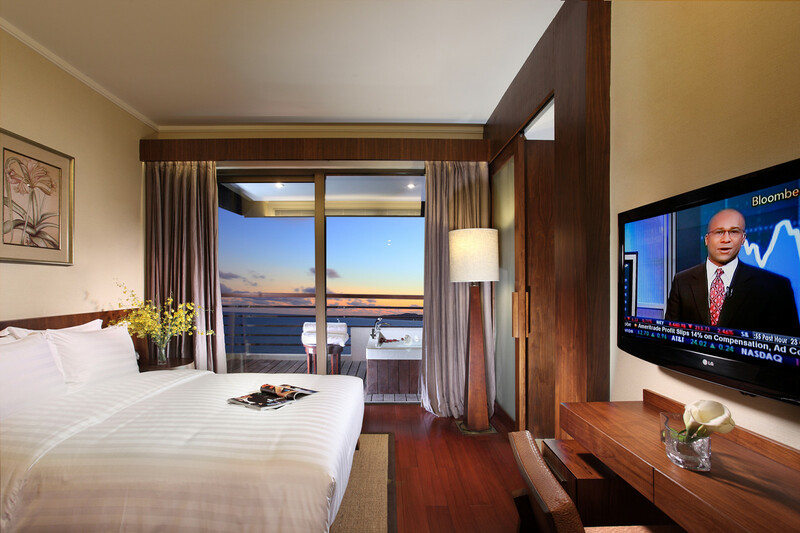 3 Bed Room Suite Ocean View: with 1 master bedroom with 1 king size bed(1.8*2.0 meters), 1 guest room with one queen bed (1.5*2 meters) and 1 child room with 1 single room (1.2*2 meters), 3 bathrooms, 1 living room, 180sq.meters, full kitchen with refrigerator, great ocean view balcony with bathtub, washing machine, breakfast for 4 adults + 2 kids or 5 adults. 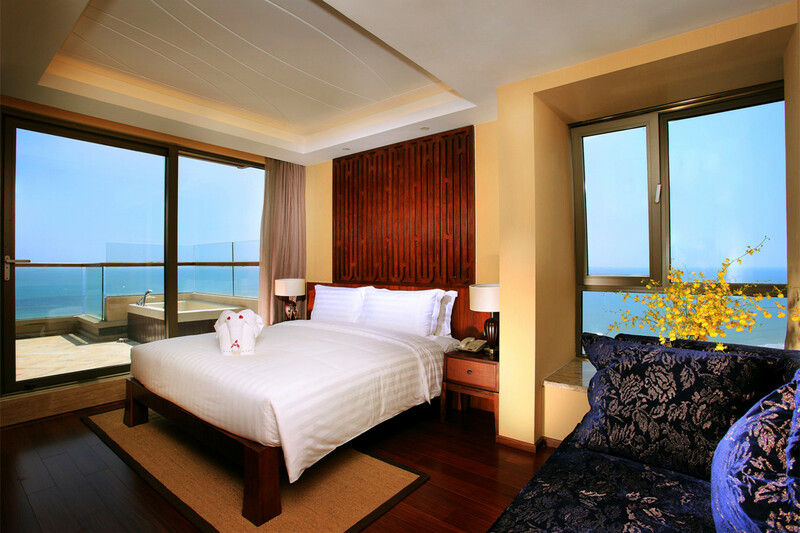 5 Bed Room Suite Ocean View: with 3 king size beds (1.8*2.0 meters), 1 child room with 1 single room (1.2*2 meters), and 1 babysitter room(1.0*2.0 meters), 3 bathrooms, 1 living room, 350sq.meters, full kitchen with refrigerator, great ocean view balcony with bathtub, washing machine, breakfast for 6 adults + 2 kids or 7 adults. 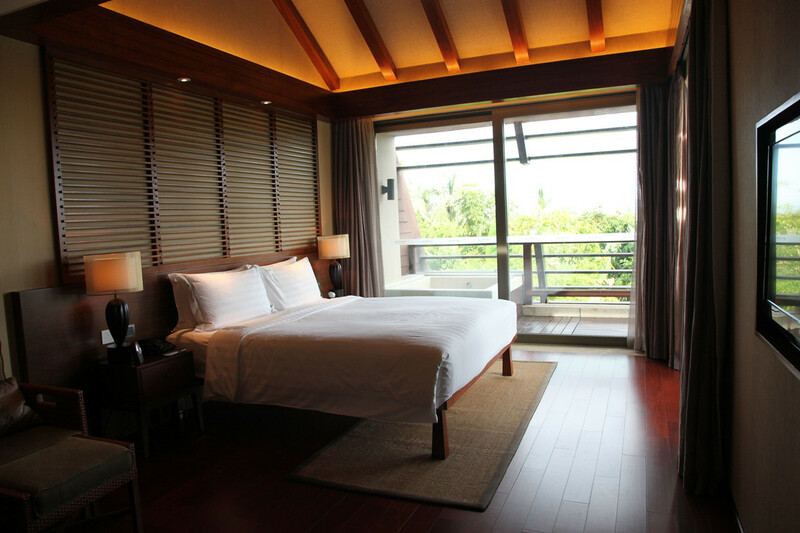 3 Bed Room Villa with Pool: with 6 breakfasts: a 3 floors villa, private swimming pool, and garden, 3 bedrooms,1 babysitting room with the bed 1.1 meters, 2 living room on the 1st and 2nd floor, 1 study room on the 3rd floor. 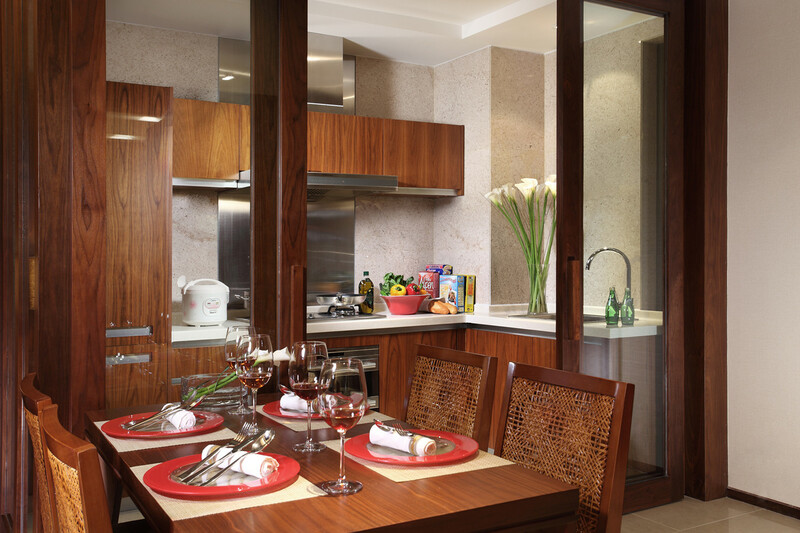 Chinese and Western Food, Delicatessen. 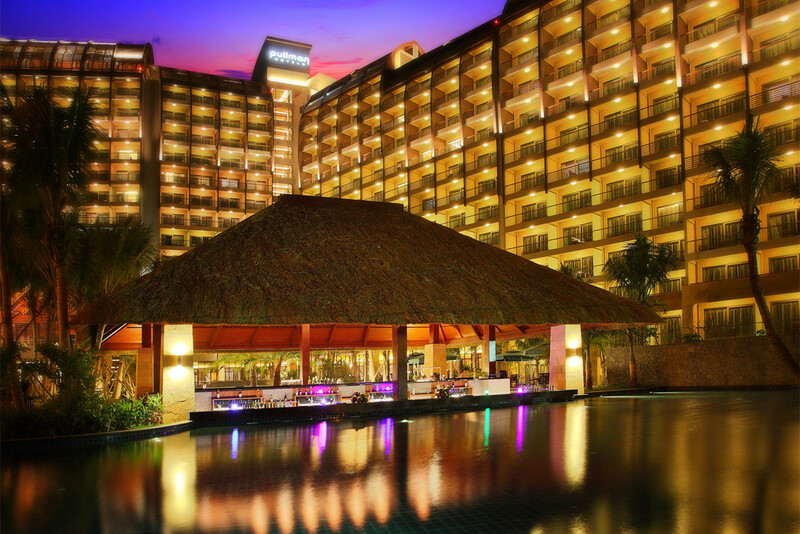 Beach Bar, Pool Bar, Lobby Bar, Breeze Bar, Red Sun Bar, Sun Set Pavilion. 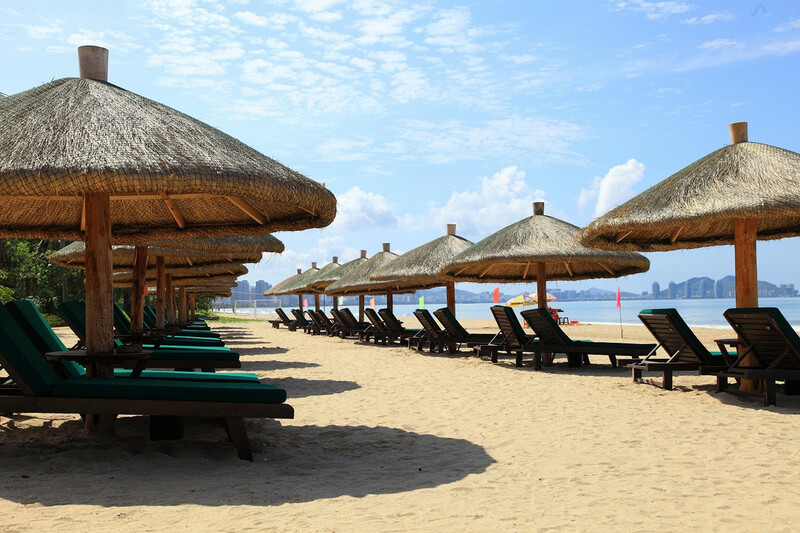 Boat excursions, Deep sea fishing, Kayaking, Rafting, Rowing, Sailing facilities, Snorkeling/Scuba diving center, Windsurfing facilities, outdoor unheated pool, Mini-golf. 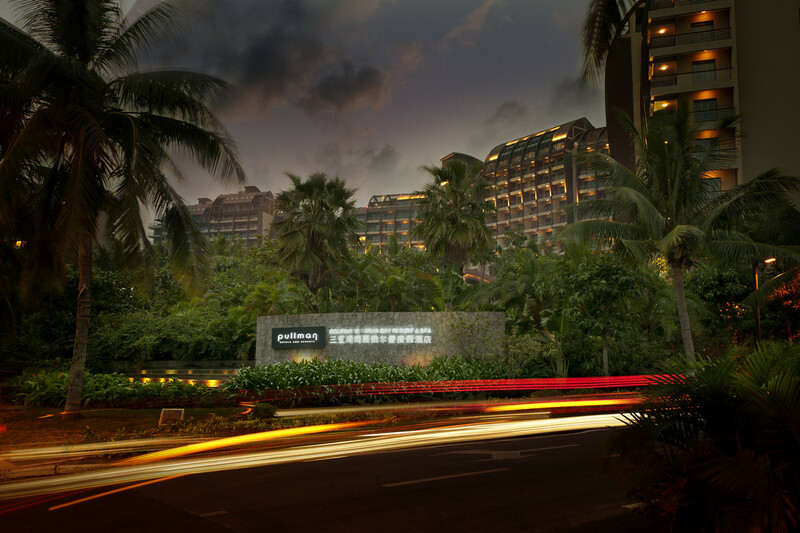 The Sanya bay International Golf Club is only 20 minutes driving from the Pullman Oceanview Sanya Bay Resort. 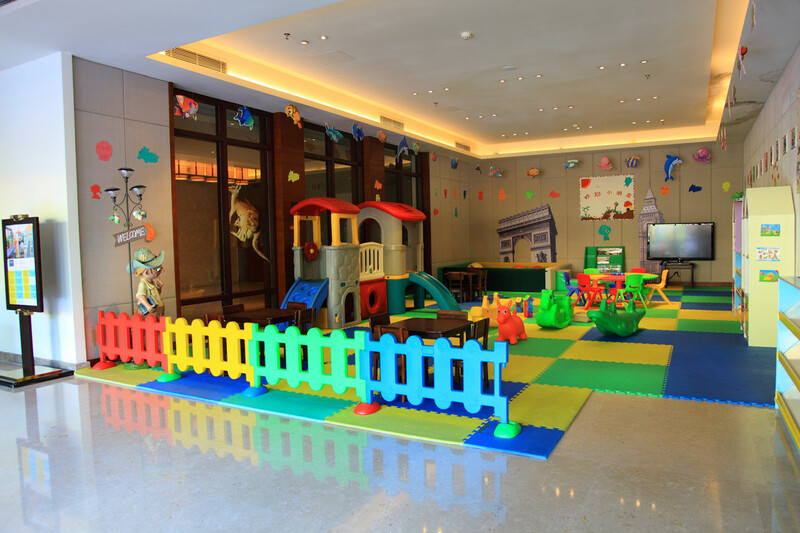 Kids Pool, Out-door kid club, babysitting available with extra cost at RMB80/hour, but need to book one day before.